"I'm not ugly, I'm just modelled that way." Ever since the first whispers of an expansion pack for Neverwinter Nights 2, those who know me can attest the excitement of my anticipation. The original game held me captivated for days and days, despite its obvious semi-complete stage of release and terrible bugginess. 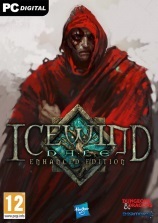 Once the game was sufficiently patched, however, a fully immersive and interesting storyline began to emerge, and an intricate character development system which gave the ability to customise your character not seen often in the gaming world. So when I heard the expansion was on the way, the excitement level obviously began to rise. 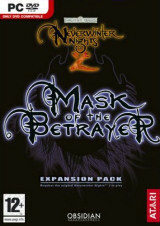 The more I heard of Mask of the Betrayer, the more I grew impatient for its release. Promises of much improved gameplay, impressive advances in the graphics department where the original game was lacking in performance, the golden promise of Obsidian's community support, who wouldn't find themselves slightly on edge waiting for its arrival? Then we began to hear of the new content that would be included. The Genasi race, powerful elemental-related humans, half-drow, the infamous Spirit Shaman class. Anticipation grew to an almost palpable level. Then, finally, the game was released. I impatiently queued for my pre-ordered copy, waiting to throw it into my DVD drive as soon as I got home, and once it was in my hands, I was almost tripping over my feet to get it home. A quick installation process, and I was away! Deciding to begin with I would play through the game with my original character from NWN2 to save time, I played away for a good half an hour. Then, for some inexplicable reason, my party turned on each other, slaughtered themselves to a man, and the game crashed. I was forced to smile and shake my head as I thought to myself "what more did I expect?" Luckily, Obsidian were on the ball (no sarcasm intended, honestly) and instructions were released on how to install the game to avoid serious issues, and a hotfix, that good old word we've come to rely on in the days of what I call "paying customer beta testing". Once more, I whacked in the DVD and took a week off work. I wasn't going to miss this. First impressions were mixed, to be sure. The graphics themselves were much improved in terms of performance, everything ran smoothly and quickly, and at the risk of sounding ungrateful, almost a little too much. The mouse turning was a little over sensitive, as was the zoom facility. This of course, brings us to the abysmal camera angles. The game defaulted to "character mode" where the camera follows just over your character's shoulder so you can almost see through their eyes. Much as this sounds like fun, it was awful, and near on impossible to get used to. The camera is restricted to the enclosed space of wherever you are, meaning that if you enter a tunnel you are forced into a wonderful view of the back of your character's head. As long as you're outside, it isn't really that noticeable, but as soon as you go indoors, you'd better hope you don't get forced into unexpected battle. The strategy mode is a lot easier to get along with, and isn't restricted to the enclosed space, however to begin with it isn't anchored to your character which I found a little disorienting. Fortunately, the options page allows you to fiddle and tweak the camera controls to your liking, and your attention can finally shift to other things. You are immediately linked with an NPC upon entering the story, a Red Wizard of Thay. Regardless of what you say or do, she is forced into your 2-man party in a way which brings me to my biggest gripe with this game. The expansion has a distinct lack of NPCs, a total of 5 to choose from in the game. The most you can have in your party at once is 3, which is enough to work your way though the game without too much difficulty, but as there are two NPCs which are mutually exclusive, your choices are severely limited. If you were hoping to mould a party to your liking, you will be disappointed. NPC interaction in MotB is almost exclusively self-initiated, and if you're willing to take the time to talk to your NPCs over and over again throughout the game, you can get a decent depth of character and at least semi-interesting stories for each one. It is also possible (and not difficult) to gain or lose influence with your characters, who are often predictable and easy to play until they are putty in your hands. While we're on the subject of characters, I feel it necessary to point out the Genasi addition to the game. Obsidian made a huge fuss over the addition of this race in MotB, even held a press release at E3 about them, but did they really measure up to their hype? Well, no. To be honest, (as I said once in chat) "they're humans with a single semi-useful ability apiece and funky hair", and I think that about sums them up. After the amount of excitement they caused before we saw them, I find it rather disappointing the excitement they caused afterwards. What is probably the most disputed function in Mask is the spirit bar. Throughout the story, your affliction will dictate your play style, for better or worse. The spirit bar, regardless of whether you are good or evil makes play a little more urgent. Resting becomes risky, hanging around almost impossible and travel can cause troubles if you're not careful too, which can turn from difficulty to annoyance very quickly if you've used your daily suppress or don't want to increase your craving. Later on, alternative forms of filling your spirit bar become apparent, although they aren't always appropriate or usable. If you intend to play your way through in an evil capacity, be prepared to get VERY frustrated with this part of the story. Despite the definite playability of the original campaign in Neverwinter Nights 2, no-one could truly accuse the game designers of exhausting the barrel of original ideas. I mean, the bad guy at the end was a truly excellent depiction of evil and eventual Armageddon, but the entire lead-up to your encounter with him is something of a “same-old” dungeon crawl. So imagine my delight when I found out that the story of the expansion is decidedly better in almost every way. The game's ending was completely unexpected, right up until the designated moment where the game designers wanted you to go “aah!”. In a lot of games, you tend to find that a good half of the quests have little, if anything to do with the main quest, and most of your time is spent wondering why on earth your PC would be doing such a thing during a time of obvious need for haste. While I occasionally found myself mildly confused trying to follow several different threads of the story at once, they all came together brilliantly at the end. Overall, despite its drawbacks, this game reminds me of the Simpsons. All the parts are imperfect and dysfunctional, yet somehow, they mesh together surprisingly well. I thoroughly enjoyed playing this expansion, and I must say the story was wonderfully thought out. Not many games reach for "epic" and achieve it quite so well, though it has to be said the game is not as difficult as many would hope for. With high level and epic level spells in abundance making the combat just a little bit difficult to follow at times, you can however, rest assured that your companions will pummel anything that moves with meteor swarms and vampiric feasts as long as they have any control over their own actions. If you're looking for a challenge, you can always replay the original campaign with a new race though, eh? In conclusion, I'm forced to say that much of the expansion is not quite what we were promised. We could do with many more choices in the party formation, and a few different ways to manage the spirit bar wouldn't go amiss. The story is fantastic, if somewhat confusing until the whole thing gets wrapped up at the end. To be fair though, the main function of a game is to enjoy it, and have fun, both of which I did with Mask of the Betrayer.